We realize as parents ourselves, and as educators, how much learning continues even when school’s not in session. So to help your kids–and ours–grow in new ways and try unprecedented adventures, we again are offering all different kinds of camps this summer. Our camps are active, hands-on, and Christ-centered. We’ll guide campers to explore new things while they learn about God’s amazing world! We’ve got everything from “Broadway Bound” and “Survivorish” to the more traditional “Volleyball” and other sports camps, all of which are taught by experienced staff. Camp grades in the description are for the 2019-2020 school year. Morning camps are 2 1/2 hours from 9-11:30 am Monday through Friday, and afternoon camps go from 12 noon-3 pm Monday-Thursday. Camps cost $100, unless otherwise noted. Camps marked with an * are sports specialty camps that focus on a specific skill of a particular sport for 1 1/2 hours, and cost $50. You can extend the camp experience to a full day by choosing both am and pm sessions, then selecting a $20 supervised lunch time (students provide their own lunch) on the registration form. 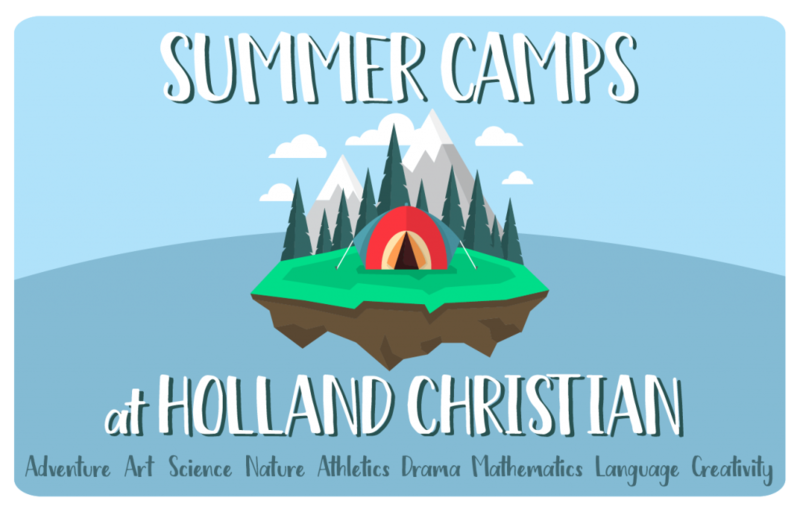 All camps are located at, or start and end each day at, Holland Christian High School unless otherwise noted. Moms, let us wear your boys out for you! And this camp does that perfectly, with fun-filled activities that develop and nurture the mind, body, heart, and spirit! The boys start the morning out at the football field for football fun and skills through games with HCHS football staff and players. Next, the boys dig into Legos up to their elbows and create a different project each day, finishing the morning with a session of basketball in the gym with Coach Kool and HS basketball players. Sign up today and invite your friends–this is a camp you won’t want to miss! Do you want your son to not only have fun all week but learn a ton about basketball along with some real life lessons? Then, the Little Maroons Boys Basketball Camp is the place for them to be! The camp is designed to increase your sons’ basketball skill levels by focusing on areas such as ball handling, passing, and shooting. The HCHS varsity boys basketball team will also be leading this camp, which makes this such a special camp for all involved. We cannot wait to see you there and look forward to serving your son again this summer! Revelation Wellness is a Christian whole person fitness movement based out of Phoenix, AZ, with the idea of educating and inspiring people to live healthy and whole lives in Christ so they can better take Christ’s love to others. Our HC “Whole and Free Camp” takes these same great ideals and brings them to our local middle school girls, showing them how to build unstoppable beauty from the inside out! The camp includes a variety of life changing activities, including drumstick workouts (an amazing experience, we’ve heard! ), prayer hiking, journaling, food preparation, and of course, beauty regimen, along with plenty of surprises! Campers learn to avoid pitfalls of the beauty trap and discover their identity in Christ in a fun way. This week leaves its impact forever! This is a focused basketball camp that creates consistent shooters, with increased range and speed, preparing middle school boys and girls for more playing time on the court! Campers are amazed at the jump in ability levels, all through specific shooting drills and personal attention! The Boys Basketball camp enhances middle school skill basketball development by focusing on the fundamentals of the game of basketball–ball handling, passing, catching, shooting, and spacing on the floor. But we do it in a fun-filled, light-hearted atmosphere with the help of varsity HC basketball players, who can give individual attention to campers on specific skill sets. We believe that basketball is both a fun and purposeful game, besides a vehicle to teach life skills in a Christ-centered way! We are excited to offer a middle school level softball camp at the beautiful HC varsity field for summer softball fun! Campers learn the softball essentials of batting, fielding, base running, throwing techniques, and the role of specific positions, all helping middle school players to take their game to the next level–while also growing in love for the game! The camp is lead by varsity softball Coach Bruns with support from the other HC softball coaches and varsity players, creating time and space for one-on-one attention and skill improvement, while in a positive Christ-focused environment. We use the sport of softball and competition as a way to learn life skills and Christ-like attitudes. Have you seen Survivor? Watched the Amazing Race? This camp blends challenges similar to those on these shows giving middle school aged kids an opportunity to hone and practice their 21st century skills of collaboration in a fun and competitive manner. We travel Holland, heading off campus daily to actively engage in contests utilizing the wonderful resources of this community. Participants are randomly assigned teams for each challenge, winning points to compete for coveted role of the overall SURVIVORish winner. The challenges test mental, physical, and strategic skills as well as problem solving, with a bit of and luck! This engaging opportunity is designed to build community and honor God with play. Are you ready to collaborate and compete? Let the Season 2 games begin! This camp is aimed at girls who are interested in learning the game of basketball, but are still too young to focus a whole morning on it. The first half is age-appropriate basketball-focused instruction and skill development led by varsity “big sister” basketball players, similar to December’s Little Maroons Saturdays–lighthearted, engaging, and fun times playing basketball-related games together. For the second half of the morning, the campers play a variety of group games that expand physical activities and focus on gross motor skills, including volleyball, soccer, and softball, all led by HCMS PE teacher Joel Leegwater. If your girls loved Little Maroons Girls Basketball Saturdays in December, they will love this camp too! With the individual focus of the varsity HCHS basketball players, upper elementary girls can improve their essential basketball skills of dribbling, shooting, ball-handling, footwork, and passing, but all in a supportive, lighthearted environment. This camp also introduces defense strategies and offense plays, while also encouraging positive competition in a Christian manner! Discover how to start a fire, pitch a tent–or build your own shelter, and identify edible plants and signs of animal life–all with the idea of surviving on your own! Spend the morning experimenting with various survival techniques while having fun with new friends. Survival campers go on plant identification hikes (although we’ll eat snacks provided by the teachers rather than found under rocks! ), learn animal footprint tracking, and try out shelter constructing and trap building. Join us for some summertime outdoor fun! Rain or shine! Calling all Padawans who have always dreamt of becoming a Jedi Master one day! Do you have what it takes? This camp puts Jedi-wanna-bes through a rigorous course of Jedi training and skill development. Learn to duel with the lightsaber you make, practice the intricate art of levitation using the force as we travel from planet to planet throughout the galaxy. Join us you must. May the force be with you! Know you love the game of basketball, but want to take it to the next level? This camp is for those middle school girls who want to improve not only their basic basketball skills of dribbling, shooting, ball-handling, footwork, and passing, but also want to practice more with a variety of offensive and defensive strategies. Coaches and varsity HCHS players show campers how to work hard through the game and drills, but also enjoy the hard work, and have plenty of fun along the way! Encourages positive competition skills, and in a supportive Christian manner! Volleyball is a favorite sport at HCS, and we love to share it with as many girls as possible! Upper elementary girls of all levels can join us for an exciting week of strengthening their volleyball skill sets, including passing, setting, hitting and serving–while also enjoying the game in an encouraging community. With HC varsity volleyball team members there to mentor their younger friends along, our coaching can be individualized, geared to helping each player develop new specific skills on their level. Bring your sisters, friends and neighbors for quality instruction from qualified HC coaches! Post Camp lets middle school basketball players focus on polishing their skills in that down-low post position, including rebounding, shooting, stance–all with personal attention and focus in a dynamic setting. They will be amazed at how much they learn in such a short time! Their game will improve tremendously through developing the correct fundamentals of post play–making them even more valuable to their team. This camp is an awesome idea for any kid who loves to ride a bike. Here’s what we do together: Explore new (and old!) favorite awesome places in Holland. Become a bike handling ninja with better bike handling skills, which equals less crashing, which equals fewer owwies! Build independence and confidence. Meet new friends. Learn to bike safe and smart both around town and on trails. Maintain and care for trails, and God’s creation! Develop swanky bike repair and maintenance skills. Have FUN and be active! We expose our young cyclists to both trail and city bicycling, and in a supportive and encouraging environment–cause we want everyone to love cycling as much as we do! A couple of requirements: Your own mountain bike-style bike with gears, and a helmet. Questions? Contact Jenny White at jenny@velo-citycycles.com. A great introduction to the wonderful world of theater arts, “Acting Adventures” is a no-pressure, exciting acting camp that helps upper elementary kids develop self-confidence and valuable theatre skills while in a supportive and Christ-focused environment. Using creative drama games and activities, campers enjoy learning theater basics such as voice, movement, character development and mime–great skills not just for the stage, but also real life! By the end of the week, they create their own improvised version of a classic story, complete with simple costumes, props, and scenery, and are able to share it with any friends or family on the the last day of camp. We love volleyball, and we love to share it with others excited about the game! Middle school girls of all levels can join us for an fun week of enhancing and polishing volleyball essentials through games and supportive contests. With extra help from our high school volleyball team, we can gear our coaching to individual skill sets, while also emphasizing motor skills and volleyball-related conditioning. Bring your sisters, friends and neighbors for quality instruction from qualified HC coaches! We want to kids to keep their Spanish skills–and even start some–throughout the summer, hence this delightful week of outdoor Spanish adventures! Campers, whether in Spanish Immersion classes or not, will use large gross motor skills and cross-cultural mindsets to play a diversity of sports from other countries, all while speaking and listening to native Spanish speakers. ¡Vamos a divertirnos! Are you ready to lace up your running shoes? In this class girls will combine the enjoyment of running with a variety of exciting games and challenges to improve both their running skills and mental focus for the sport. But there’s more, too–Coach Jillian is the first to tell you, though, that she runs her best races when she’s chasing after Jesus, and loves to mentor girls not only in the sport of running, but also in love for Jesus! Boys learning the sport of volleyball?! What a great opportunity this is for middle school males to play the sport of volleyball here in Holland–a fun life-long skill, whether for future church groups or beach volleyball tournaments! Sessions are designed not only to keep kids active and to get them as many repetitions with a volleyball as possible, but also to have a ton of fun with creative drills, challenges, games, and prizes. Plus we recognize how important healthy competition is in a supportive Christian environment! Football is such a great avenue to teach middle school boys about character, life skills, love for Christ–and that’s this camp’s focus! It’s for athletes–and football-lovers–of all athletic abilities to improve their skills, knowledge, and fitness specific to the game of football. It features instruction from current high school coaches and players, and is structured in such a way as to foster a love for the game through age-appropriate friendly competition and teamwork. Our daily themes use the context of football to nurture and develop the mind, heart, and spirit, teaching middle school boys to strive for excellence and to glorify God in all aspects of life. Come dip your brush into the watercolor world! Love to paint but your watercolor paintings are a muddy mess? With this camp, middle school kids get to learn new watercolor techniques and create finished paintings for their bedroom–or living room!–walls at home. We have fun, make a mess, and gain confidence in a really fun medium! This camp is a great intro for upper elementary boys to the game of football, in a setting that focuses on the game, but not exclusively, since most kids this age need a bit of sports variety still. So we start with football, but also get into other physical games and sports that still teach character, life skills, love for Christ. Like our other football camps, we have the help of our current varsity football players and coaches, and can offer that individual attention in a friendly and fun setting, to foster a love for the game through age-appropriate competition and teamwork. Through our daily themes, we like to use the context of football and sports in general to nurture and develop the mind, heart, and spirit, to strive for excellence and to glorify God in all aspects of life. Get an amazing handle, and up your basketball game! This basketball handling-focused camp helps players slap, wrap, drop and flip, not to mention crossover and scissor–all to challenge, equip, and train players in all things dribbling and ball handling. From point guards all the way to centers, everyone improves as players if they can handle the ball with skill, and break down defenders. It’s time to take your handle up a notch! There are a growing number of high schools with boys’ volleyball club programs in West Michigan–a sign of growing interest in the sport from coast to coast! This camp is a great opportunity for high school males to participate in the wonderful sport of volleyball here in Holland–a fun life-long skill, whether for future church games or more competitive beach volleyball tournaments! Sessions are designed not only to keep teens active and get them as many repetitions with a volleyball as possible, but also to have a ton of fun with creative drills, challenges, games, and prizes. Plus we recognize how important healthy competition is in a supportive Christian environment! Want to learn to fly? Why not try pole vaulting? Both middle school boys and girls are invited to head on out to the track for a week of learning the fundamentals of pole vaulting, aka short-distance flying, including runway approaches, safe takeoffs and more. Athletes have plenty of time on the runway to try this unique and thrilling sport, and encourage their teammates as they try something new to HCS. By the end of the week, participants will have the chance to vault over a bungee and/or the bar and experience the excitement of reaching new heights! Bring your friends out to try this incredibly fun track and field event! Do you watch YouTube and wonder, how do they do that? Join us to learn how to edit video like the pros using an iPad and iMovie, then post what you make to an international audience! Middle School participants create their own YouTube channels and upload their work to it. But we also want to make sure our digital footprints are safe, appropriate, and God-glorifying, all while remaining positive and uplifting, light-hearted and creative! Some parental involvement may be required to create the initial YouTube channel, and resources are also available to help parents monitor YouTube watching and posting. Imagine walking down 8th Street on a hot summer day, and suddenly you quickly have to get out of the way. You hear faint music and see a group of kids in formation. What is a group of students like this doing on summer vacation? A crowd starts to gather to cheer on the group. You walk up closer to get the full scoop: First it’s a zumba song, with the rhythm of the beat flowing through their feet. Then, it’s Praise and Worship music with the lyrics of each song guiding their movements as they go along. Next, it’s a number one hit playing, as the group hops in unison, fists pumping in midair. But, just as quickly as they were there, the group slinks back into the shadows and disappears. As observers begin to depart, they ask where to go next, to see such art. Join us for a week of dance and be that pop-up flash mob all around Holland! Our camp is an opportunity to move, perform, dance, and bring joy to others. Join the latest sport sweeping the nation–for both boys and girls! Find out what the rage is all about, and why kids from every walk of life are loving this sport! With our varsity level lacrosse athletes joining us, we can supply the individual attention to improve lax skills at every level, working through a fun variety of passing, shooting, stick work drills, as well as through pure love of the game. We are committed not only to teaching lacrosse skills, but to help build the Christian character of our campers to be successful both on and off the field. Experience Forest School–where kids lead learning through play in rain or sunshine! We play and learn in a local majestic forest where we see God’s undeniable existence, sing Forest School praise songs, and use a variety nature’s elements–sand, clay, mud, sticks, trees, streams–to make all sorts of creations. When adults let children lead play, beautiful things happen, and children begin to play as God intended them to play. Put down all things man-made, and see what fun kids have in the forest with play toys created by God for them! Come enjoy a week you won’t forget while improving your skills in the world’s most popular sport! This high-energy camp is designed to develop all the skills needed to move boys’ soccer skills to the next level. Utilizing strategies taught at the HCHS Varsity level of play, HCHS Soccer Coach Dave DeBoer and his Varsity players teach and encourage soccer players with a curriculum that has been developed for upper elementary students. Players fine tune proper soccer skills, learn problem-solving techniques, and practice what they’ve learned through controlled scrimmages. Come enjoy a week you won’t forget while improving your skills in the world’s most popular sport! This high-energy camp is designed to develop all the skills needed to move girls’ soccer skills to the next level. Utilizing strategies taught at the HCHS Varsity level of play, HCHS Girls Soccer Coach Elliot Slenk and his Varsity players teach and encourage soccer players with a curriculum that has been developed for upper elementary students. Players fine tune proper soccer skills, learn problem-solving techniques, and practice what they’ve learned through controlled scrimmages. Casting any middle school students who want to explore the joy and fun of acting in a fun, light-hearted, and stress-free production! Based on Holland Christian High School’s highly successful and unique 24-Hour Theatre program, students get to experience all the facets of the stage in one week–writing, directing, acting, staging, and ending the week with a production for a live audience. Explore acting with all the fun and none of the drama! Come enjoy a week you won’t forget while improving your skills in the world’s most popular sport! This high-energy camp is designed to develop all the skills needed to move soccer skills to the next level. Utilizing strategies taught at the HCHS Varsity level of play, HCHS Soccer Coach Dave DeBoer and his Varsity players teach and encourage soccer players with a curriculum that has been developed for middle school students. Players fine tune proper soccer skills, learn problem-solving techniques, and practice what they’ve learned through controlled scrimmages. Girl boss=”A confident, capable woman who pursues her ambitions, instead of working for others or otherwise settling in life.” Come to Girl Boss camp for middle school girls, and have unimaginable fun, while exploring your God-given gifts in a variety of areas, including creativity, technology, physically, and emotionally–besides learning healthy self care! Throughout our week together we develop incredible friendships while trying new physical and creative endeavors together! Come join Mrs. Boer and Mrs. Wright for a summer of becoming confident in your girl boss abilities. Come enjoy a week you won’t forget while improving your skills in the world’s most popular sport! This high-energy camp is designed to develop all the skills needed to move girls’ soccer skills to the next level. Utilizing strategies taught at the HCHS Varsity level of play, HCHS Girls Soccer Coach Elliot Slenk and his Varsity players teach and encourage soccer players with a curriculum that has been developed for middle school students. Players fine tune proper soccer skills, learn problem-solving techniques, and practice what they’ve learned through controlled scrimmages.